On Friday E celebrated Chinese New Year at school, they did Tai Chi and had a parade around the school with their homemade instruments. When he got home from school, he was tired so he relaxed on the couch to watch some Dinosaur Train. I took this picture because I wondered where this teenager had come from. Our new babysitter came over (she lives on our street!) to look after the boys while Dave and I went out for dinner. We had some gift cards for the Keg so we went to the one on King West. I ordered my usual prime rib and it was so yummy! Selfie with the CN Tower on our way home. Saturday morning came quickly but we were up and at 'em for skiing. 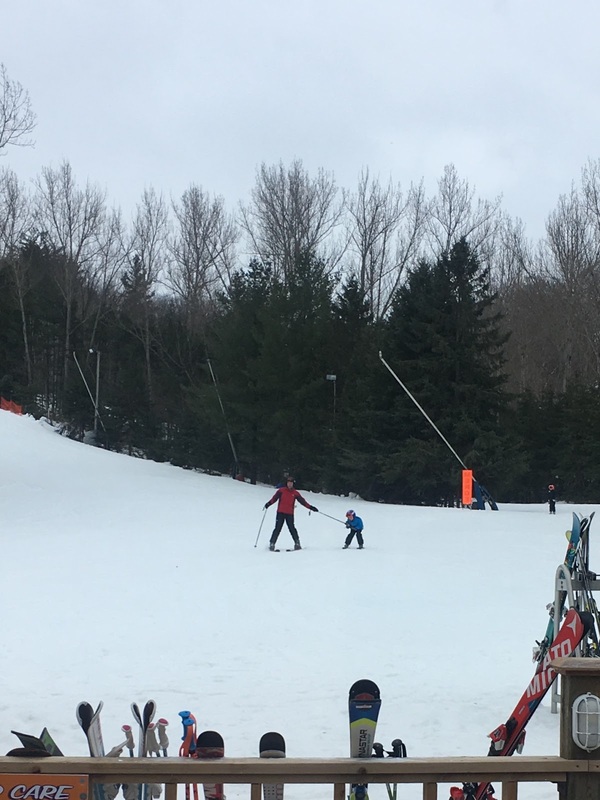 Dave skied in the morning and then I skied in the afternoon with E. He is skiing so well, it was much less stressful than I thought it would be. It also helped that we were with other kids and parents so we could follow them down the hill. Dave and Q took a walk over to see us at the lift and snapped some photos. On Sunday morning, we decided to skip church since E and I were both feeling a little under the weather. While Dave went for his run, we watched The Parent Trap (with young Lindsay Lohan). It was pretty cute and I think E enjoyed it. Then he and Dave hopped on the subway to go to Monster Truck Jam at the Skydome. Dave had kept it a surprise so E was pretty excited when he found out where he was going. While they were gone, Q napped and I did some tidying around the house. Then we went to Walmart (my favourite place, especially on a Sunday afternoon #sarcasm) to get some stuff for our trip, like sunscreen, baby wipes, etc. We had planned to go out for supper after the monster truck show but Dave and E were both tired so I whipped up some macaroni and cheese and took some sausage rolls out of the freezer for a cozy supper. We finished our evening with the Raptors game and an episode of Mr. Selfridge.